Thailand’s military seized power from an elected government on May 22, 2014, with the justification that it wanted to end chaotic and violent political confrontations that had wracked the country for years. But more than an attempt to restore stability was at play. The coup really was traditional ruling elite’s latest and most decisive intervention in what is now a decade-long war for political power with billionaire telecommunications tycoon-turned-politician Thaksin Shinawatra. Thaksin was a popular prime minister from 2001 until he was booted by an earlier coup in 2006. After years of political turmoil and musical chairs, his sister Yingluck Shinawatra came to power in a landslide election victory in 2011. Her government was ousted in the 2014 coup following about six months of protests and political street-fighting that paralyzed Bangkok, the capital. Arrogant and flexible in his ethics, Thaksin alienated the educated, urban middle class and alarmed traditional ruling circles — royalists and the military — who also feared his lock on the electorate challenged the power structure. The military also worried he would interfere in the succession when the revered and ailing King Bhumibol Adulyadej — on the throne since 1946 — ended his reign. Thaksin has lived abroad since 2008 to avoid serving prison time for a corruption conviction he says was politically motivated. The anti-Yingluck protests were sparked by an amnesty bill that could have allowed Thaksin to return to Thailand a free man. The junta has since restored order, but at the cost of suspending many civil liberties, most notably freedom of expression. The military holds near-absolute power through Article 44 of the junta-imposed interim constitution. 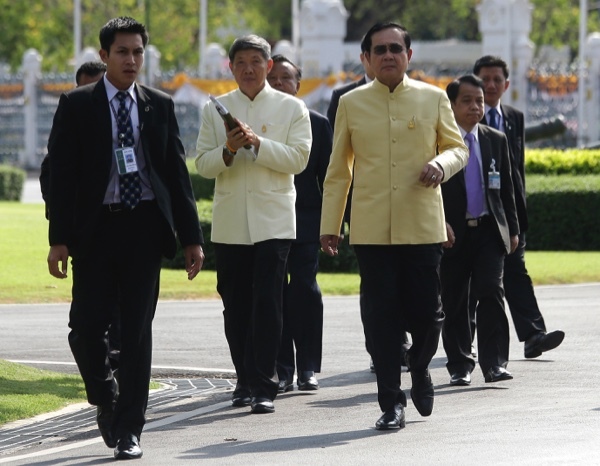 It allows Prayuth to take any measures deemed necessary to promote public order and unity. Most of the repression so far has been applied with a touch more paternalistic than brutal. When threats fail to keep critics and dissidents in line, they are detained at military bases, usually for no more than a week, for interrogation sessions called “attitude adjustment.” One major exception: Those convicted of insulting the monarchy face up to 15 years in prison. Lately, however, junta officials frustrated by repeat offenders have suggested they be sent to “re-education camps,” which implies at least longer detainments. Another ominous development is the prosecution of human rights lawyers. Military courts are empowered to try certain types of civilian cases. In March, the military were given police-like powers to seize assets, search premises and arrest and detain criminal suspects. Junta critics have expressed particular outrage over the recent arrest of the mother of a pro-democracy activist. Her alleged crime: failing to rebuke a Facebook friend who sent an alleged anti-monarchist message. The junta inherited a lagging economy, with policymakers hindered by years of political instability. Macroeconomic indicators showed Thailand underperforming much of the region, though this year’s estimated first-quarter growth of 3.2 percent was stronger than expected. Thailand’s export-led economy was especially vulnerable to China’s downturn. Two of the strongest export sectors face other problems as well. Agriculture has been weakened by severe drought, while scandals in the fishing and seafood industry — involving labor abuses and illegal fishing practices — risked sanctions in the markets of the EU and the United States. Tourism, however, has remained strong, even after a bomb blast last year in central Bangkok killed 20 people. Boosting investment has been difficult, with some ambitious infrastructure projects stalled in part due to political uncertainties. Instead, the government has focused mainly on increasing consumption to stimulate the economy, particularly in rural areas. These measures, such as farming subsidies, were similar to Thaksin government policies that his critics derided as populist giveaways to buy voters’ loyalty. What concerns economists is that the junta’s generally narrow focus on political stability constrains it from tackling the country’s acknowledged structural problems — competitiveness, industrial production capacity, productivity, education and training, state-owned-enterprise reform — that the pre-coup turmoil allowed to fester. Traditionally close relations between the United States and Thailand, its oldest ally in Asia, have seemingly been shaken. Moves by Bangkok to cozy up to Beijing have been widely interpreted as a response to Washington’s scolding of the military for uprooting democracy and violating human rights. The U.S. suspended USD4.7 million in security assistance funds and stopped top-level diplomatic exchanges. Washington has made clear that those restrictions will remain until civilian rule is restored. Prayuth, however, has been able to visit the U.S. for multilateral events. The U.S. has also continued to stage in Thailand its largest multilateral military exercise in the Asia-Pacific, albeit it on a smaller scale than before the coup. Thaksin’s most virulent critics regard U.S. cheerleading for liberal democracy as tantamount to backing for the former prime minister. Junta officials have expressed their annoyance at Washington, but how deep their anger actually runs is hard to gauge — anti-American statements play well with their supporters, but military-to-military relations run deep. Bangkok’s flirtations with Beijing involve relatively modest investments, closer military relations, and an increasing willingness to extradite Beijing’s political opponents, despite international criticism. At the same time, however, Thailand has stood fast against unfavorable financing terms offered by the Chinese for a much-desired major rail project, and has expressed interest in joining the U.S.-led Trans-Pacific Partnership trade agreement. Thailand’s ruling generals have made clear they are not planning to yield control anytime soon. Initial plans to hold an election in 2015 were deferred until 2016, and are now deferred again until 2017. The draft charter will be voted on in an Aug. 7 referendum that amounts to the first measurement of public sentiment toward the military government. The exercise will be far from free and fair — campaigning for or against the draft is subject to nebulous rules that could land activists up to 10 years in prison. Even the sale of a “Vote No” T-shirt is considered against the law. Prayuth has said the junta will press ahead with its plans regardless of the outcome, suggesting that if the draft charter is rejected, a replacement will be enacted without a popular vote. In any case, a rejection would deeply undercut the legitimacy the junta has claimed for itself.